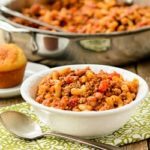 Skillet Chili Mac is classic comfort food. This quick and easy recipe only takes about 20 minutes to prepare and is a hearty meal full of flavor. While the pasta is cooking, brown ground beef in a large skillet over medium-high heat. Break up the beef with a spoon while browning to crumble it. Drain grease from beef and return beef to the skillet. Add skillet sauce, chili beans, and tomatoes. Stir to combine. Bring to a boil then reduce heat to simmer for 10 minutes. Add cooked pasta and cheese. Stir to combine. Cook until cheese is melted, about 2 minutes.